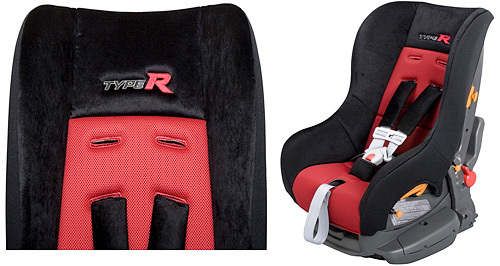 Honda Type R Child Racing Seat Accessory | OhGizmo! Honda just released the Civic Type R Sedan in Japan and as part of the car’s accessory list the company will also be selling this custom Type R child racing seat. I’m not sure if it’s only available in this red and black finish or if it can be custom ordered to match your own car’s interior. What I do know though is that it’s definitely a lot cooler and safer looking than the phone books and bungee cords my parents used when I was a kid. Unfortunately the special Type R seat seems to be limited to Japan at the moment and can only be purchased from a Japanese Honda dealer for about $370. I am getting this for my kid. Be glad you got a phone book and some bungee cords. Back in my day, you had to spill soda pop on the seats and let it dry. That kept ya from going anywhere.